Helloooooooo...Woohooo buuuuuusy day ahead today and tomorrow and Sunday :). 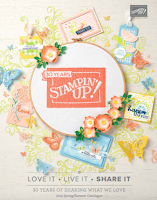 Today some of my fabby team and I are heading for the Yorkshire Event Centre in Harrogate to set up our booth for the upcoming show this weekend. My hallway is crammed packed with stuff and I am still trying to tick off things of my list but I should be finished shortly, she says optimistically. I am showing two very simple cards I made lately with quite limited supplies, well not limited but a pre chosen kit let's say. Bright colour combo of Marina Mist, Certainly Celery, Early Espresso and zingy Pumpkin Pie it all looks like the greenhouse gala DSP don't you think? 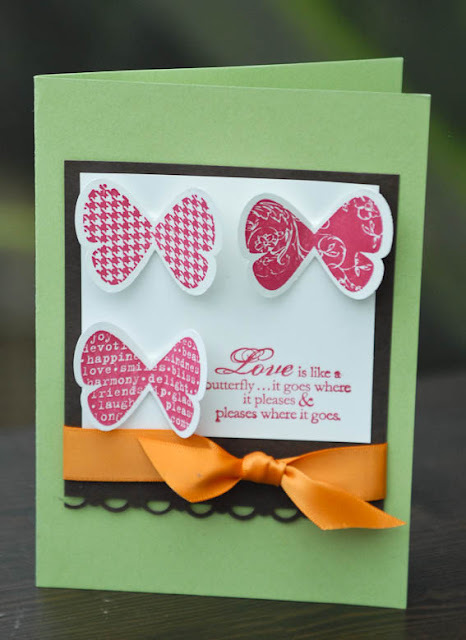 The scallop trim punch and the sweet Butterfly Prints stamp set, I love this set purely because it has a matching punch that is always such a bonus, matching punch equals quick :) Quick card that uses just ink paper and a punch or two. Next one is not as successful but I still like. 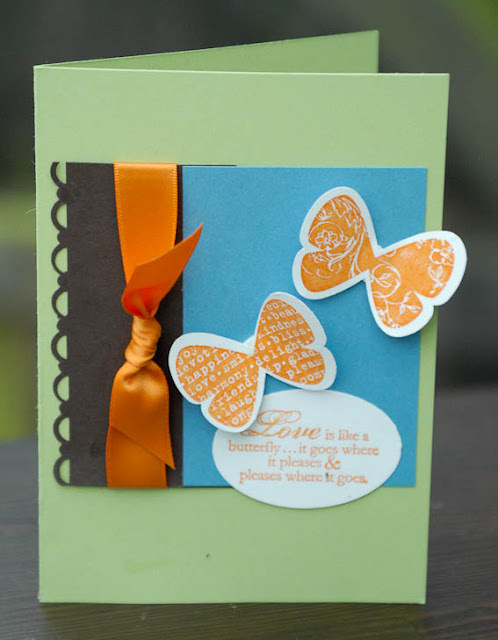 I am drawn to symmetric cards as I am a bit of a symmetry freak and these flutters lend themselves nicely to this kind of look and layout. This time I used just one colour ink Rose red and my card stock was Certainly Celery and Early Espresso, I have made a classic mistake here with this card. When you choose colour for your projects you should consider picking at least 3 colours or more but no more than five really (unless you're making a tone on tone card or going for the monochrome look). I always try and have a main colour that is picked up in different parts on my project (example ink, ribbon, card) then balance the rest of the colours out . Well you can see how wrong I got it here with this card, is not a bad card at all is just not as nicely balanced as it could have been. I should have added some orange brads to the bodies of the flutters and stamp my sentiment in espresso ink. I still like the layout and I love this set, it is so very easy to work with, these cards only took me 10 minutes each and if you look at the layout is virtually the same just turned a bit. 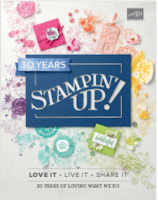 I love stunning cards that take forever but the reality is that I cannot always take an hour of my time to make just one card, so having such fabulous coordination that SU products are offering me is what keeps me so in love with this Company, I can never make a bad card even if I tried. Right I need to dash hopefully I will see you soon with a video of the stand, remember that tree I was telling you about? I am dying to see it in situ. If you're visiting this weekend make sure you come and say hello, and if you mention my blog you get an extra draw into the FREE PRIZE *SWEET*. ps. I found more buttons so I still have another 12 kits in brights the first 10 sold out in 2 days. So if you fancy a bit of pretty on your wrists buy a kit today. Very pleased with my bracelet. I've just finished making it up and will wear it to quilting tonight. You may get some extra orders!! 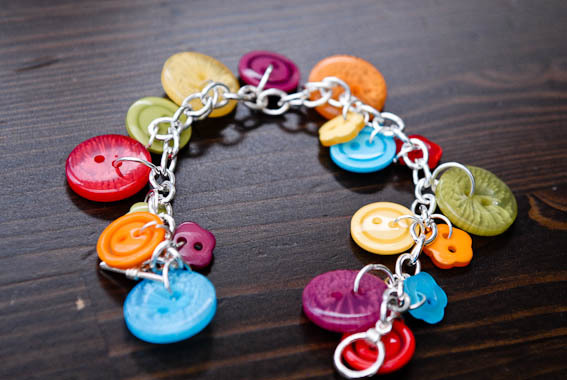 Monica thank you for the beautifully packaged button bracelet kit. I love it!